In the early 1970s, Bekenstein argued that the second law of thermodynamics requires one to assign a finite entropy to a black hole. His worry was that one could collapse any amount of highly entropic matter into a black hole — which, as we have emphasized, is an extremely simple object — leaving no trace of the original disorder. This seems to violate the second law of thermodynamics, which asserts that the entropy (disorder) of a closed system can never decrease. However, adding mass to a black hole will increase its size, which led Bekenstein to suggest that the area of a black hole is a measure of its entropy. This conviction grew when, in 1972, Hawking proved that the surface area of a black hole, like the entropy of a closed system, can never decrease. The similarity between black holes and thermodynamic systems was considerably strengthened when Bardeen, Carter, and Hawking (1973) proved three other laws of black hole mechanics that parallel exactly the first, third, and “zeroth” laws of thermodynamics. Although this parallel was extremely suggestive, taking it seriously would require one to assign a non-zero temperature to a black hole, which all then agreed was absurd: All hot bodies emit thermal radiation (like the heat given off from a stove). However, according to general relativity, a black hole ought to be a perfect sink for energy, mass, and radiation, insofar as it absorbs everything (including light), and emits nothing (including light). The only temperature one might be able to assign it would be absolute zero. This obvious fact was overthrown when Hawking (1974, 1975) demonstrated that black holes are not completely “black” after all. His analysis of quantum fields in black hole spacetimes revealed that the black holes will emit particles: black holes generate heat at a temperature that is inversely proportional to their mass and directly proportional to their so-called surface gravity. It glows like a lump of smoldering coal even though light should not be able to escape from it! The temperature of this “Hawking effect” radiation is extremely low for stellar-scale black holes, but for very small black holes the temperatures would be quite high. 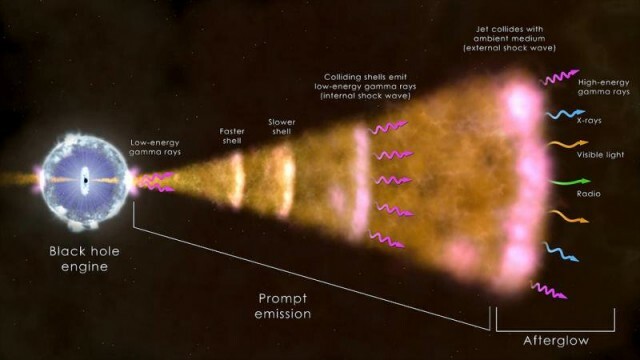 This means that a very small black hole should rapidly evaporate away, as all of its mass-energy is emitted in high-temperature Hawking radiation. In the context of thermodynamic systems containing black holes, one can construct apparent violations of the laws of thermodynamics, and of the laws of black hole mechanics, if one considers these laws to be independent of each other. So for example, if a black hole gives off radiation through the Hawking effect, then it will lose mass – in apparent violation of the area increase theorem. Likewise, as Bekenstein argued, we could violate the second law of thermodynamics by dumping matter with high entropy into a black hole. However, the price of dropping matter into the black hole is that its event horizon will increase in size. Likewise, the price of allowing the event horizon to shrink by giving off Hawking radiation is that the entropy of the external matter fields will go up. We can consider a combination of the two laws that stipulates that the sum of a black hole's area, and the entropy of the system, can never decrease. This is the generalized second law of (black hole) thermodynamics. However, Unruh and Wald (1982) argue that there is a less ad hoc way to save the generalized second law. The heat given off by any hot body, including a black hole, will produce a kind of “buoyancy” force on any object (like our box) that blocks thermal radiation. This means that when we are lowering our box of high-entropy radiation towards the black hole, the optimal place to release that radiation will not be just above the event horizon, but rather at the “floating point” for the container. Unruh and Wald demonstrate that this fact is enough guarantee that the decrease in outside entropy will be compensated by an increase in the area of the event horizon. It therefore seems that there is no reliable way to violate the generalized second law of black hole thermodynamics. Arguments along these lines led ‘t Hooft (1985) to postulate the “Holographic Principle” (though the title is due to Susskind). This principle claims that the number of fundamental degrees of freedom in any spherical region is given by the Bekenstein entropy of a black hole of the same size as that region. The Holographic Principle is notable not only because it postulates a well-defined, finite, number of degrees of freedom for any region, but also because this number grows as the area surrounding the region, and not as the volume of the region. This flies in the face of standard physical pictures, whether of particles or fields. According to that picture, the entropy is the number of possible ways something can be, and that number of ways increases as the volume of any spatial region. The Holographic Principle does get some support from a result in string theory known as the “AdS/CFT correspondence.” If the Principle is correct, then one spatial dimension can, in a sense, be viewed as superfluous: the fundamental physical story of a spatial region is actually a story that can be told merely about the boundary of the region. 5.2.2 What Does Black Hole Entropy Measure? In classical thermodynamics, that a system possesses entropy is often attributed to the fact that we in practice are never able to render to it a “complete” description. When describing a cloud of gas, we do not specify values for the position and velocity of every molecule in it; we rather describe it in terms of quantities, such as pressure and temperature, constructed as statistical measures over underlying, more finely grained quantities, such as the momentum and energy of the individual molecules. The entropy of the gas then measures the incompleteness, as it were, of the gross description. In the attempt to take seriously the idea that a black hole has a true physical entropy, it is therefore natural to attempt to construct such a statistical origin for it. The tools of classical general relativity cannot provide such a construction, for it allows no way to describe a black hole as a system whose physical attributes arise as gross statistical measures over underlying, more finely grained quantities. Not even the tools of quantum field theory on curved spacetime can provide it, for they still treat the black hole as an entity defined entirely in terms of the classical geometry of the spacetime. Any such statistical accounting, therefore, must come from a theory that attributes to the classical geometry a description in terms of an underlying, discrete collection of micro-states. Explaining what these states are that are counted by the Bekenstein entropy has been a challenge that has been eagerly pursued by quantum gravity researchers. Hawking's discovery that black holes give off radiation presented an apparent problem for the possibility of describing black holes quantum mechanically. According to standard quantum mechanics, the entropy of a closed system never changes; this is captured formally by the “unitary” nature of quantum evolution. Such evolution guarantees that the initial conditions, together with the quantum Schrödinger equation, will fix the future state of the system. Likewise, a reverse application of the Schrödinger equation will take us from the later state back to the original initial state. The states at each time are rich enough, detailed enough, to fix (via the dynamical equations) the states at all other times. Thus there is a sense in which the completeness of the state is maintained by unitary time evolution. It is typical to characterize this feature with the claim that quantum evolution “preserves information.” If one begins with a system in a precisely known quantum state, then unitary evolution guarantees that the details about that system will evolve in such a way that one can infer the precise quantum state of the system at some later time (as long as one knows the law of evolution and can perform the relevant calculations), and vice versa. This quantum preservation of details implies that if we burn a chair, for example, it would in principle be possible to perform a complete set of measurements on all the outgoing radiation, the smoke, and the ashes, and reconstruct exactly what the chair looked like. However, if we were instead to throw the chair into a black hole, then it would be physically impossible for the details about the chair ever to escape to the outside universe. This might not be a problem if the black hole continued to exist for all time, but Hawking tells us that the black hole is giving off energy, and thus it will shrink down and presumably will eventually disappear altogether. At that point, the details about the chair will be irrevocably lost; thus such evolution cannot be described unitarily. This problem has been labeled the “information loss paradox” of quantum black holes. These considerations led many physicists to propose scenarios that might allow for the unitary evolution of quantum black holes, while not violating other basic physical principles, such as the requirement that no physical influences be allowed to travel faster than light (the requirement of “microcausality”), at least not when we are far from the domain of quantum gravity (the “Planck scale”). Once energies do enter the domain of quantum gravity, e.g. near the central singularity of a black hole, then we might expect the classical description of spacetime to break down; thus, physicists were generally prepared to allow for the possibility of violations of microcausality in this region. A very helpful overview of this debate can be found in Belot, Earman, and Ruetsche (1999). Most of the scenarios proposed to escape Hawking's argument faced serious difficulties and have been abandoned by their supporters. The proposal that currently enjoys the most wide-spread (though certainly not universal) support is known as “black hole complementarity.” This proposal has been the subject of philosophical controversy because it includes apparently incompatible claims, and then tries to escape the contradiction by making a controversial appeal to quantum complementarity or (so charge the critics) verificationism. The challenge of saving information from a black hole lies in the fact that it is impossible to copy the quantum details (especially the quantum correlations) that are preserved by unitary evolution. This implies that if the details pass behind the event horizon, for example, if an astronaut falls into a black hole, then those details are lost forever. Advocates of black hole complementarity (Susskind et al. 1993), however, point out that an outside observer will never see the infalling astronaut pass through the event horizon. Instead, as we saw in Section 2, she will seem to hover at the horizon for all time. But all the while, the black hole will also be giving off heat, and shrinking down, and getting hotter, and shrinking more. The black hole complementarian therefore suggests that an outside observer should conclude that the infalling astronaut gets burned up before she crosses the event horizon, and all the details about her state will be returned in the outgoing radiation, just as would be the case if she and her belongings were incinerated in a more conventional manner; thus the information (and standard quantum evolution) is saved. However, this suggestion flies in the face of the fact (discussed earlier) that for an infalling observer, nothing out of the ordinary should be experienced at the event horizon. Indeed, for a large enough black hole, one wouldn't even know that she was passing through an event horizon at all. This obviously contradicts the suggestion that she might be burned up as she passes through the horizon. The black hole complementarian tries to resolve this contradiction by agreeing that the infalling observer will notice nothing remarkable at the horizon. This is followed by a suggestion that the account of the infalling astronaut should be considered to be “complementary” to the account of the external observer, rather in the same way that position and momentum are complementary descriptions of quantum particles (Susskind et al. 1993). The fact that the infalling observer cannot communicate to the external world that she survived her passage through the event horizon is supposed to imply that there is no genuine contradiction here.